Slubice is a city in the voivodship of Lubuskie in Western Poland. It lies directly across the Oder River from the German town of Frankfurt an der Oder, and the two cities were actually a single municipality (called Dammvorstadt) until 1945. As of the 2008 census, the town had a total population of 17,000 (agglomeration 25.000), and is the capital of Słubice County. The name Słubice is a modern Polish version of Zliwitz, a settlement east of the Oder River mentioned in Frankfurt's city charter in 1253. Given its proximity to Germany, the town is an important transport hub of the A2 autostrada to the German Bundesautobahn 12, part of the European route E30 from Warsaw to Berlin. 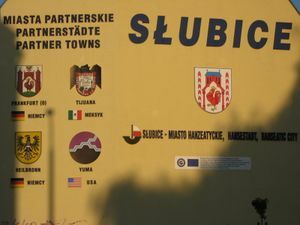 Słubice is closely linked to its German sister city west of the Oder-Neisse line, and one can walk or drive across the bridge from Germany to Poland and back with minimal trouble. The town is small enough that one can easily travel by foot to all worthwhile destinations; walking from one side to the other does not take more than twenty minutes. All street signs are in Polish, and only a small number of people (possibly none) seem willing or able to speak either English or German although this is rapidly changing especially among the younger generation. Children in school since the Enlargement of 2007 which paired the city with its' German neighbor are required to become at least conversant in German just as children of Frankfurt am Oder are required to become at least basically conversant in Polish. This is easier than it was before as the two cities can now readily receive one another's TV and radio broadcasts as they are in the same digital format. This was harder in the analog days when the two systems had the same PAL base format but different video and audio carriers. Most children learn English as a necessity. If you need a taxi, you will find a taxi stop next to the bridge. Alternatively you can order a taxi by phone (eg. Czesiu, +48 602 858 475). A Slubice taxi can take you to Germany but the route needs to start in Poland just as the German taxis can take you to Slubice but the trip needs to start in Germany. There is a scenic park with its own fountain in the center of town. The Collegium Polonicum - A cross-border academic institution which was jointly brought into being and is being maintained by the European University Viadrina and the Adam Mickiewicz University. Its library contains an attractive collection of books, specific to major fields of study and is interesting for readers of the region. There's a Wikipedia Monument a quick walk from the Polish end of the bridge. It's apparently the only one in the world. Go past the traffic circle and then take a right, you'll see it standing in sort of a park. A five minute walk north of the main bridge brings one to a large "Rezerwat przyrody" (Nature Reserve), where one can enjoy a beautiful walk through the woods, collect mushrooms, or fish. One can also see the remnants of trenches, now covered with forest growth. Germans often cross the border to buy cigarettes here at a somewhat reduced price. There are money changing stands and shops crowded all around the main bridge, so go there to change your money although this is becoming increasingly irrelevant as many shop owners take Euros directly at around a 1:4 ratio to Zlotys (2017). The reverse is not nearly as true in Frankfurt am Oder even right near the bridge, and as Polish moneychangers often offer a better rate, it's wise to change your Zlotys into Euros before you leave Poland. There are several kebab shops scattered throughout the town, as well as a number of finer restaurants. If you don't read Polish, be prepared to guess about what you are ordering. Karczma Koliba at ul. Wojska Polskiego 163. Take the left road from the park with the fountain and its about 150 m on the left. Its a fabulous traditional Polish restaurant designed like a wooden cabin inside and out. Extensive menu of traditional Polish cuisine including pierogi cooked to a fabulous standard. Very cheap prices. City Residence Hotel Frankfurt-Oder located in front of the train station costs about €39 per person, see the homepage at: http://www.hotel-city-residence.de or make direct booking at:0049 335 66 42 666. A budget option is to stay at the university's hall of residence on the Polish side of border (Slubice). The price is 54 PLN (€13) for a single in a studio with kitchen. The standard is surprisingly high for the price. To make the booking phone +48 95 759 22 24 or use this form. The Internet Cafe "Kafejka internetowa" is located at Daszyńskiego 1 near the center of town. 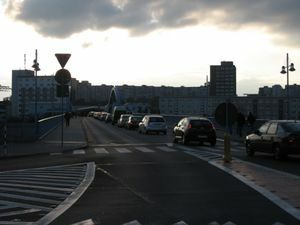 One can easily travel by car from Slubice to Zielona Góra (German: Grünberg), the capital city of Lubuskie. This page was last edited on 18 October 2017, at 18:24.